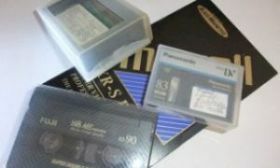 The transfer of VHS, 8mm tapes, mini DV and camcorder cassettes to DVD is one of BVP's specialities. Video transfers are carried out in-house so you can easily communicate any special requirements. Prices are based on quantity, video format and running time. Please call 01737 245404 for advice. Location details. If you have video tapes with short recording times, these can be compiled to to one DVD with chapters for each video. We can burn most video tape formats to DVD (see list below). For costs and advice please call 01737 245404, location details. NEW we can now transfer DVDs to MP4 digital files suitable for playing on your computer and home editing (note MP3 is usually for audio files). VHS, VHSC, SVHS, SVHSC, 8mm camcorder tapes, Hi8mm camcorder tapes, miniDV, home movies, DVCam and HDV. Not sure what sort of tape you've got? Have one to hand when you ring and we'll advise. Prices vary slightly depending on tape format. Please note we do not transfer NTSC standard tapes (from America and Japan), commercial tapes without copyright clearance, Hi8mm video tapes recorded in long play or digital 8mm (we can, however, transfer 8mm cine film). The DVD format supplied in this service is DVD-R. DVD-Rs will play on the vast majority of DVD players. Please note these are not computer files but DVDs designed to be played in a DVD player - they will also play on computers if there is a DVD player installed. The DVDs are not suitable for editing purposes, they are provided in a 'watching' format (Mpeg2). If you require video files for basic editing and/or uploading please enquire about our new DVD to MP4 service. If you require other types of video files see our encoding service. We do not recommend encoding for large quantities of domestic footage at present. The above service is the cheapest and most practical method for storing large quantities of footage. If you want specific sections of tape onto DVD see our editing service.